Deputy Economy and Sustainable Development Minister Genadi Arveladze attended the session of the European Integration Parliamentary Committee. Deputy Minister presented the 2018 Plan Completion Report of Agreement on Deep and Comprehensive Free Trade Area (DCFTA) and Plan for 2019. In his speech, Arveladze emphasized the significance of the DCFTA agreement when speaking about the growing trade with the European Union. In comparison to 2017 trade turnover between Georgia and EU increased by 17.7% in and in 2018 it reached $3.35 billion, much in part thanks to the DCFTA agreement with the EU. Exports have grown by 11.5% and constituted $7.30 million while imports have increased by 19.5% and reached $2.62 billion. Deputy Minister also mentioned diversification of export products to the EU in 2018. As reported by Arveladze, compared to 2014 the number of companies exporting from Georgia to the EU increased by 37% and reached 789 companies. It was also stated that between 2014-2018 Georgian products such as kiwis, blackcurrants, apples, quinces, glass bottles, furniture, and other products entered the EU market. Georgian side is also working with the EU on behalf of opening the EU market for products of aquaculture and animal origin. 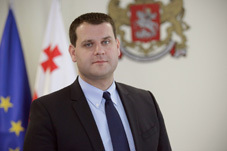 Besides that, Deputy Minister noted, that since the session of Georgia-EU geographic designations sub-committee in 2018, Georgian geographic markings of “Tee from Tkibuli”, “Honey from Machakhela”, “Herbs from Kutaisi” and “Potatoes from Akhalkalaki” are protected. Arveladze addressed the already fulfilled and carrying on reforms as well. Special attention was drawn to the reforms that are carried out in terms of creating the supervision system for manufacturing products on the market: change of codex regarding the safety of products and technical regulation on construction products. Deputy Economy and Sustainable Development Minister also said that with the support of the German International Partnership Society (GIZ) an export strategy that focuses on textile, furniture and communication technologies will be created. According to Arveladze, these fields will have big export potential in the EU market. At present, the DCFTA 2018-2020 Action Plan is carried out. The DCFTA creates a closer economic integration of Georgia with the EU based on reforms in trade-related areas. This regime increases market access between the EU and Georgia based on having better-matched regulations. It is based on the principles of the World Trade Organization. It removes all import duties on goods and provides for broad mutual access to trade in services. It allows EU and Georgian companies to set up a subsidiary or a branch office on a non-discriminatory basis. This allows the foreign company to benefit from the same treatment as domestic companies in the partner’s market.